Out My Front Door: What Do They Mean...Pro "Choice"? 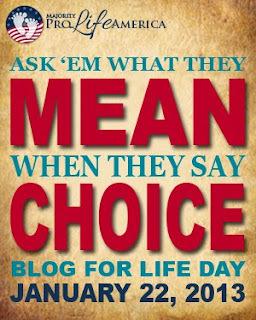 What Do They Mean...Pro "Choice"? I am a firm believer in the precious sanctity of human life. Life revolves around the people it is made of. That is extraordinarily beautiful, and profoundly powerful. And in the climb for liberties for all, we sometimes lose sight of what we mean by all. Throughout history mankind has striven for freedom for our family and neighbors, for equality between race and gender. We have always kept striving. But sometimes we take a massive step back. Many people believe in having a "choice" between having their conceived child, or not. Aborting it. How, amid all these good things we have fought for, can America believe in abortion? In killing the future, destroying the dreams conceived in the womb? We go to war to defend our freedoms for the present, and for future generations. Yet we believe we have the right to kill the future generation already conceived, waiting to be born. Individuals! How can we continue to live like this? The children cannot speak for themselves, cannot defend their existence, except by the miracle that they do exist. They are a living soul. They do not have a choice. By chance, they may be conceived in a woman who loves and desires her child--or by someone too frightened or heartless to acknowledge their individuality. Abortion doesn't just destroy the child, but often enough, the woman. Abortion is a crime that has a punishment that is twofold. A horrible reality that stretches all over the world. Today I want you to really consider what "choice" means. The definition of choice is the ability to be able to decide between options--the liberty to do so. "Pro-choicers" hail this as a wonderful freedom for women. Is it truly, when those who are being destroyed, have to suffer it in silence? When no one defends their life? God bless, and may we strive for an abortion-free America, and world. Every life is beautiful, and precious. They are what make the world. ~ The moment conception takes place, the light of a human life begins to burn within the womb.